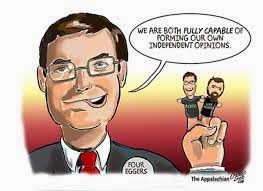 The only thing that most Watauga republicans want from ASU and Appalachian students, faculty,and employees is their $$$$! Given the current Eggers-Aceto majority on the Watauga County Board of Elections,we are 'ground zero' in the State for suppression of college student voters. These guys have taken the new state-wide voter suppression campaign and done everything they can locally to further minimize the opportunity for ASU students to vote. You can see from the court document filed (link in NY Times article) that Watauga is front-and-center as example of local actions beyond the new State-Voter-Restrictions to be the stopper for ASU student voters.